Straddie Kingfisher Tours began over 18 years ago because Dave and his wife Margaret have such a passion for the Island. They just wanted to show this Island Paradise to the world in an Eco friendly, informative and sustainable way. Being part of the Island community since 1966 they can offer you that local knowledge and give you that personal touch. You get to see the wonderful scenic vantage points on Straddie to observe all the dolphins, turtles, manta rays and the Humpback Whales from June to November each year. Morning tea and their famous barbecue on the beach for lunch has been included for you to enjoy. You will get to look for koalas and kangaroos as you travel around this Island Paradise and may see many of the 253 different varieties of birds that inhabit the Island. This tour is conducted at a leisurely pace so you can unwind and really get the feeling of "Straddie" time! You will have a camera full of memories and a smile to suit. This tour gives you a glimpse of the best vantage spots on the Island. More for the time conscience people. You will be picked from your Island accommodation (or water taxi terminal in Dunwich if you are coming from Cleveland). You drive the full circle of the Northern section of the Island to get to know first hand all the best vantage points. This includes the beaches and bush tracks. During the drive around they'll stop off for a "Cuppa" and some "Aussie Damper" at an ideal location or when you are thirsty or hungry. Drive through the Blue Lake National Park to Main Beach. Stop on Main Beach for photos and "Wildlife Watching". From June to November they can spot the majestic Humpback Whales from this beach. Then head to Point Lookout for a toilet stop and then onto Flinders Beach. They drive along the beach to Amity Point where there are a couple of resident Koalas to photograph. Learn about the history at Amity and then head back to your Island accommodation or water taxi terminal in Dunwich about three to three and a half hours later. They will take you to the Straddie Desert to experience the thrill of sand boarding. Straddie Desert session times are either 10am to 11.45am or 12pm to 1.45pm. You can choose the session to suit you - either before lunch or after lunch. Or they can tailor the times to suit your group! Just ask! For each session in the desert they start off on the smaller slopes in order to get your technique correct and then build up to the "A" grade slopes and then to the extremely fast monster slope! Pick up time is at 7.15am outside your hotel in the Brisbane Central Business District or Surfers Paradise on the Gold Coast, then driving to Cleveland for the trip across Moreton Bay to Dunwich. Arriving in Dunwich, travel to Brown Lake for swimming, photographs, commentary and morning tea at Brown Lake. Then drive through the National Park to Main Beach stopping for photos and "Pippy" digging. Heading to Point Lookout's North Gorge, they hope to see dolphins, turtles and manta rays. June to November, spot Humpback whales from this stunning vantage point. Then onto Flinders Beach for their famous "Aussie" barbecue on the beach for lunch (sausages, garden salad, rice, beetroot, apricots and a fruit drink). At lunchtime you can take more photos, swim, enjoy beach games or just simply relax. Then off to Amity Point where you will meet the friendly koalas, maybe spot a dolphin off the jetty. Then a quick drive back into Dunwich for the return to Cleveland at 2:50pm. Arriving at your hotel at 4.30pm. "Adventure Amity" will take you kayaking around the Amity Point area called the Spit to a "Hidden" Creek amongst the Mangroves which is full of fish, turtles and stingrays, so always be on the lookout not only below but above as many species of birds habitate these mangroves as well. This is a lovely area where there is a chance to see the beautiful starfish in abundance and paddle around some of the bigger boats that are mored out in the channel. After experiencing plenty of Natures Little Wonders you can go for cool off swim around the rock wall at Amity Point South of the jetty. "Adventure Myora" will take you from the foreshores of the One Mile area in Dunwich around to the beautiful Myora Channel and paddle past the many mored boats there and continue to paddle to a ship wreck which you can explore and watch the Bream and other coloured fish dart in and around this wreck as they swim for shelter. Always be on the lookout for big Turtles, Stingrays, Dolphins and Dugongs as they also frequent these waters all the way up to Amity Point and beyond. They will give you the opportunity to explore the beauty of North Stradbroke Island in an Eco friendly and environmentally sustainable way! Visit all the hidden spots not readily accessible from a normal car. The Full Day Eco Tour comes with everything supplied. Swim freshwater lakes. Enjoy Aussie damper for morning tea, including their famous barbecue on the beach for lunch. Let Dave show you this Island Paradise in style. Unforgettable! Your family or group will need to catch the 8.55am Water Taxi from Cleveland to Dunwich and there Barefoot Dave will meet you as you step ashore at 9.20am. Then travel through Dunwich (looking for koalas) to Main Beach where you stop for a Cuppa and some "Aussie Damper" for morning tea (looking for whales and eating). Travelling further north along Main Beach now with the whales that have been spotted, they arrive at the North Gorge. Here is free time to do the complete North Gorge walk. This is the most Easterly Point in Queensland and very popular for its beautiful blue scenic outlook. They also can see dolphins, turtles, manta rays and sharks can be seen from this vantage point. Lunch is provided at the Captain Cook's seat just in front of a grassy hill with a great view. Food you can carry around like egg and lettuce sandwiches or ham and salad rolls, cake, fruit plus a drink. After lunch more Whale Watching until 2pm then they drive back to Dunwich for your return at 2.25pm. Time to get out and about! 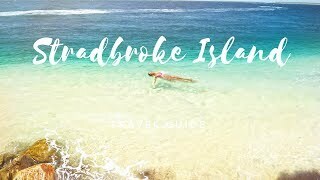 Their North Stradbroke Island Beach Fishing Adventure will take you to a surf beach that is out of the wind and the tide is right so as you will be in the best spot for success! The “Adventure” will take you out and about for three to four hours. The fish they target are whiting, bream, flathead and dart. They pick you up from the water taxi as it gets into Dunwich or your Island accommodation at a time that will suit the tide (determined when you book). You'll then head down the beach for some fishing fun.